I've just watched the Hairy Bikers for the first time and fancy a few of the recipes they had - cornbread and key lime pie added to my must make list. I wonder what cornmeal and buttermilk are in French? Maybe its the skin bit of walnuts I dislike? as I just went and ate a few and when I peeled off the skin bit I liked them , like I remembered I used to? Out on a Tuesdasy, so have the HBs to watch tonight as well as Survivors. Green Rosie wrote: I wonder what cornmeal and buttermilk are in French? Buttermilk is babeurre. Cornmeal I think is just farine de maïs - or just polenta, depending which part of France you are in. Probably better in the frugal cooking thread then. Wilhelm Von Rhomboid wrote: Probably better in the frugal cooking thread then. Wouuld you move it for me please , then, Billy? Thanks! Cheers . I went shopping today so the recipes will have to wait to next week. Oooh - saw the Nigel Slater programme last night. Some lovely stuff on there that I may have to have a go at next week. Already shopped for all this week! Sort-of -new recipe: had fish and chips for supper. The twist being the fish was rainbow trout which I have never tried battering before - it was quite super as in turned out - the earthier taste of the trout made it a bit more flavourful than cod or haddock, and the beer batter was just right - light and crisp. Oven-cooked t he chip but soaked them half a day first and blanched them before putting them in. Not a scrap was left on anyone's plates. Hairy Bikers are really good right now! Loving it! 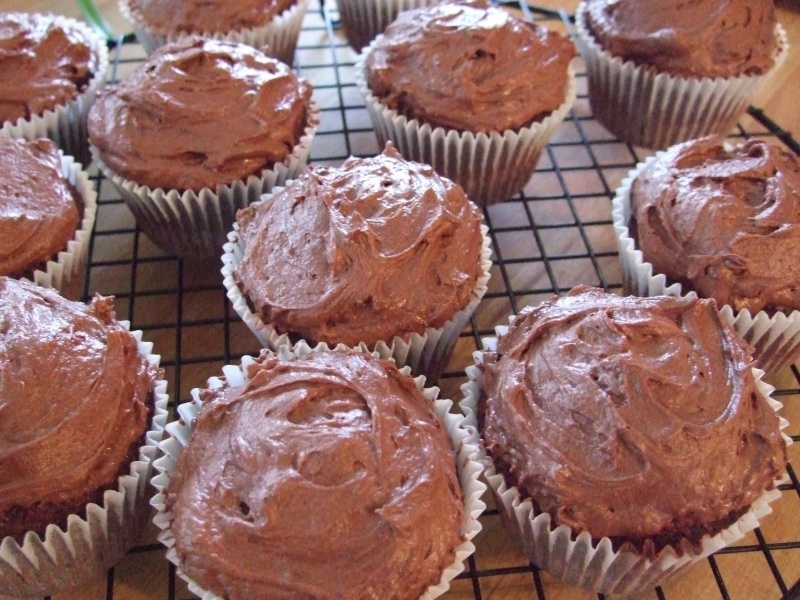 Chocolate cupcakes from the Hummingbird baker cookbook was my fourth of the year. Hope the picture turns out OK - very very yummy, but probably bad for me as well! Now they look good. Unfortunately not on my list of haves, but on my list of must not haves. MrsNesbitt wrote: Hairy Bikers are really good right now! Loving it! Admit they are a bit OTT sometimes, but they do come up with some good recipies. #6 - don't have a name for this exactly - roast sausage stew? gently roasted 8 fat home-made sausages on a bed of cherry tomatoes with sprigs of rosemary thyme and bay and sloshed with ollve oil and white balsamic vinegar, oh and plenty of garlic. Turned and basted sausages halfway through. Meanwhile in a pan did chopped red, green and yellow peppers, red onions and very finely chopped bulb and fronds of fennel. Then tool the sausages out and put aside, added the tomatoes to the other veg, deglazed the roasting tin with a large glass of red wine and into the pan on a high heat until the liquid was reduced by half, then tossed the sausages back in. Served with pecorino all over the top and buttered new potatoes on the side. Actually I have thought of a name for it: ratatouille, because that's what it was, effectively. It was a nice ratatouille but I had envisaged something where the individual flavours of the vegetables stood out rather than becoming all one. Ah well. Ya lives and learns. 7, 8 and 9 ....... OH has made a ginger beer plant and just bottled the lot but we need to wait a week before drinking it. I made Turkey au Vin and nearly set the kitchen on fire when I lit the Cointreau I'd added (I didn't have an brandy). Plus I remembered that earlier in January we had eaten our first home-made cheese fondue. Revisited the balsamic glazed chicken of #3 today, but made a buttery parmesan polenta with it this time - the hard way. It was quite a different taste experience to the normal quick-cook polenta we usually have - absolutely delicious (although the children scarcely touched it, having decided it was mashed potato and for some reason being anti-mashed potato today) and creamy smooth rather than gluey. It however require three hours of constant stirring. I am all in favour of the slow cooking movement and Slow in general but on the other hand finding three hours just to stir cornmeal of an afternoon is not immensely convenient. As it was I perched atop a stool with my laptop balanced on the adjacent burner and actually got a surprising amount of work done one-handed - I suppose because I was not able to move away from the cooker or computer. #8 : Oven-baked double-width pork chops marinated in orange and cumin with black cherry and chilli sauce, and cherry pie for pudding. Done three more new recipes this week - just need to find the time to blog about them! and something else...haven't got any further with the idea yet!